I had to laugh when I read the recent reports of the Sony e-mail hack. Apparently mega-producer Scott Rudin was in a tizzy over who would direct his new biopic about Steve Jobs. I wondered- doesn’t he know that an AMAZING biopic of Steve Jobs already exists? No, not the 2013 snooze-fest starring Ashton Kutcher. I’m talking about the 1999 TNT original movie Pirates of Silicon Valley (DVD). It’s got everything: hilarious wooden computers, mock turtlenecks galore, atrocious hair extensions, and even Anthony Michael Hall as a CREEPY Bill Gates. If you’re a nerd who enjoys learning about the evolution of home computers and doesn’t mind some laughably bad acting, look no further- this is your movie. Pirates of Silicon Valley tells the story of how Steve Jobs and Bill Gates got their starts in the computer industry, and how they became fast rivals in the high stakes race of consumer technology. Noah Wyle is actually pretty good as innovator and master salesman Steve Jobs, and Anthony Michael Hall plays Bill Gates as a jealous sociopath. Of course, the script doesn’t exactly pull any punches when it comes to Jobs either, portraying him as a demanding, sadistic boss who terrifies all of his employees. If it sounds like the movie is intense, it is- but in a good way. It’s obvious that the filmmakers were trying desperately to turn a boring story about corporate espionage and computer programming into something entertaining for the general public, and for the most part they succeeded. I walked away knowing a little bit more about these two visionaries (like politicians, they’re all crooks!) and felt wildly entertained by the terrible hairpieces most of the actors endure. All in all- I’d call it a made-for-TV success. My cocktail this week is a play off the title of the movie. While no actual pirates sail across the screen, there are still wicked, unwashed men attempting to steal vast fortunes from one another. What do pirates drink? Rum of course! While watching Pirates of Silicon Valley, I recommend drinking that classic rum tiki cocktail Planter’s Punch, which for this movie I’m re-naming Programmer’s Punch. Pour all ingredients except bitters into a cocktail shaker. Shake well. Pour into a highball glass filled with shaved ice, then top with bitters and seasonal fruit. It’s astonishing to me that Steve Jobs had enough life material to fill a made-for-TV movie long before the invention of the Ipod. As much as I love Noah Wyle and his denim jorts, I do look forward to a follow-up movie about Jobs’ amazing second act. In fact, how great would it be to hire Noah Wyle to play him again?? But pretty please- leave Anthony Michael Hall out of it. I’ve seen enough of his creepy eyes to give me nightmares for weeks. Cheers! Posted in TV Movies and tagged Anthony Michael Hall, Bill Gates, computer programmer cocktail, Noah Wyle, Pirates of Silicon Valley, planters punch, Steve Jobs, tiki cocktail, TNT movie. Bookmark the permalink. 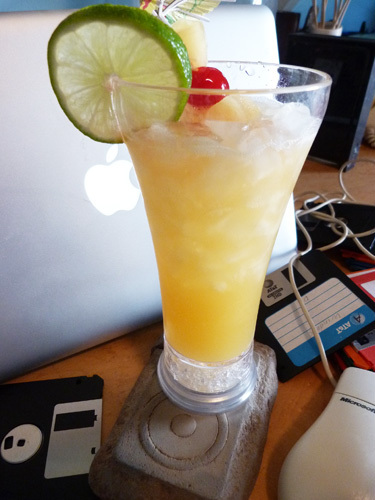 Is that a floppy disk (well, the kind after the floppy floppy disks were outdated) behind the cocktail? Extra credit. And Noah Wylie should return for sure. Yes that is an actual “vintage” floppy disc! My husband makes fossils of old computer and video game products (and sells them on http://heartlessmachine.com ) so we have a lot of that stuff laying around. Have not done Hackers yet, but the soundtrack is a classic!